LOS ANGELES, Calif. – June 9, 2016 – “AMD Presents The PC Gaming Show Powered by PC Gamer,” the second annual event for developers, publishers, hardware companies, press and fans during E3. Anticipate a mixture of exclusive new footage, latest trailers, updated details on existing games, and unscripted conversations between developers and host Sean ‘Day’ Plott. 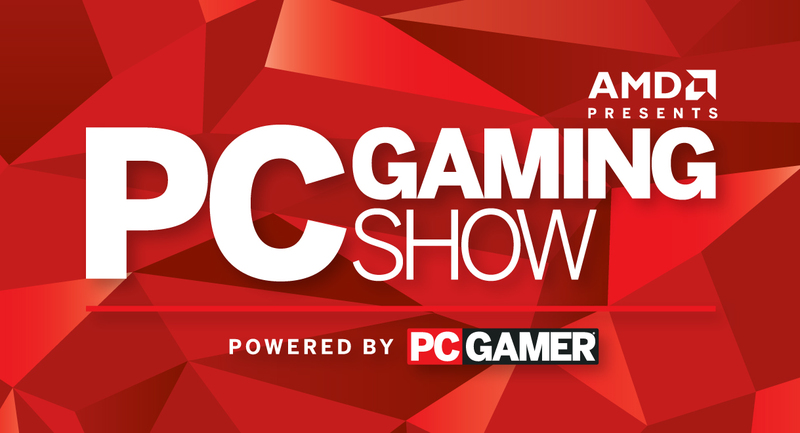 The PC Gaming Show was created to shine a light on the most powerful and versatile platform for gamers. The event celebrates exciting, innovative and unconventional projects happening across the PC world, and kicks off with an on-stage shopping spree, “The Steam Speedrun presented by Razer,” where one lucky gamer will have the chance to fill their cart with as many games as possible in three minutes, on Razer’s dime. The PC Gaming Show also adds Frontier Developments as a sponsor, joining AMD, Razer, Bohemia Interactive, and Tripwire Interactive. The PC Gaming Show will take place Monday, June 13 at 11:30am PST and held at The Theatre at Ace Hotel in Los Angeles, CA. The event is free and open to the public. Fans are invited to reserve tickets online. Book here: http://future.ticketleap.com/pc-gaming-show/.